The gender, of course, should be irrelevant, and there really ought to be a period after “favor.” Also, I do rather wish there were a comma after “for me” and agreement in number between “some person” and “their.” But the idea is brilliant; let us hope the above heralds a new age of more literary one-night stands. This entry was posted in Editing, Humour, Language, Reading and tagged book stores, communication, connection, dating, editing, humour, pick-up lines, Ruth Feiertag, wit. If you post this on fb Ms. Feirtag, I am sure you will get a hundred shares! Lovely to hear from you! And how very kind of you to say so! I have no presence on Facebook, though. I find I have more than enough to do with the places where I already lurk. But I do know (and am related to) many people who find Fb indispensable : ). Perfect! 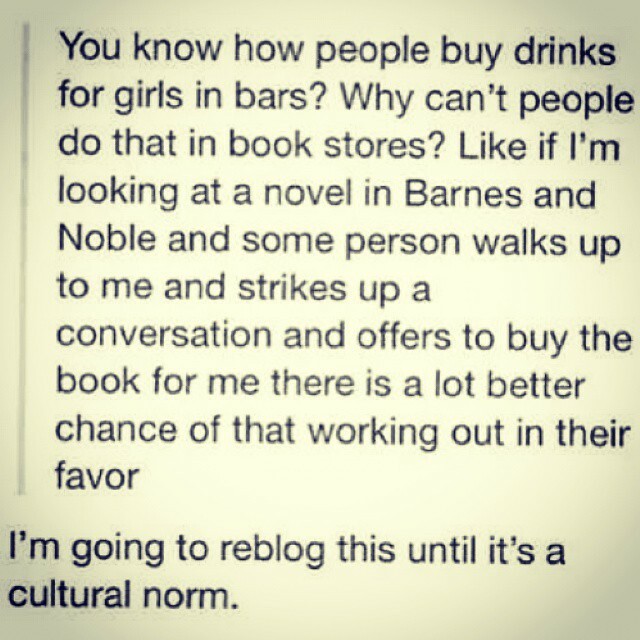 I worked in a book store for many years, and met quite a few men this way! Your story cracked me up. What a brilliant fellow to realize that the last one left was not necessarily the least desirable! And good for you for appreciating and rewarding his candour.